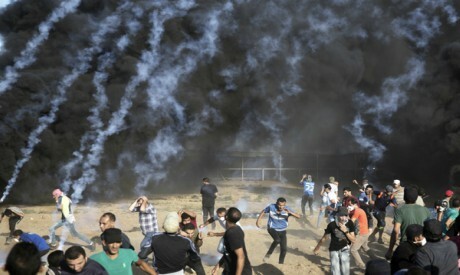 Gazans are apprehensive about the fragile calm in the Gaza Strip under sporadic Israeli air strikes, followed by counter-attacks by the Palestinian resistance. This leaves all options open: continued intermittent strikes, or a return to assassinating senior resistance figures, or even all-out war, especially amid growing discontent in Israel towards the government due to what Israeli media describes as a retreat in the face of Palestinian resistance during recent confrontations in Gaza and a failure to respond forcefully to attacks on settlements neighbouring Gaza. This has angered Israeli political and military leaders who threatened revenge. A public opinion survey published in Yedioth Ahronoth newspaper revealed that 86 per cent of Israelis want a return to assassinations of Hamas leaders to restore deterrence, while 14 per cent disagree because it would “make things worse”. Haaretz newspaper reported Israel has been readying for months to return to assassinations in the wake of continued escalation. This would be better than a broad military operation in Gaza. Ahmed Youssef, a Hamas leader, expected as much. “If a comprehensive truce is not reached in Gaza, the situation on the ground is likely to escalate exponentially. There could be intensive Israeli strikes that destabilise Gaza and terrorise Gazans,” stated Youssef. The general political and military mood in Israel is leaning towards a military strike against Gaza, according to Youssef, “whether this is through direct confrontations on the ground as we saw in 2014 or persistent and concentrated air strikes”. The former head of research at Aman, Israel’s military intelligence, added that “we must look for inexpensive solutions to the threat on the southern border, and not be distracted from other more serious threats such as Iran and Syria, and not overreact when taking decisions.” Amidror said, “Hamas feels it is safer because of its ability to deter Israel from launching a broad military campaign in Gaza, which means it carries out military training and manoeuvres on the border. He concluded: “Even if Iron Dome continues to successfully intercept Hamas rockets from Gaza, the emergency sirens are enough to drive Israelis crazy. Ibrahim Jaber, a Palestinian expert on Israeli affairs, said Israel is very worried about making a long-term truce with Palestinian resistance because that would help the latter build up their weapons stash, increase their military capabilities and prepare for the next battle. “That is why some people are demanding escalation and a strong response to Gaza, so the resistance does not feel safe towards Israel,” said Jaber. He believes Israeli threats against Gaza are serious. “There may not be all-out war before the wall on the border with Gaza is built, which aims to block the resistance from tunnelling under and killing Israelis as was the case in the last war,” Jaber explained. Another Palestinian analyst, Sadek Al-Shafei, said the request by members of Hamas’s politburo overseas to come to Gaza, and Israel’s approval, via Egypt, and guaranteeing their safety, confirms that Tel Aviv wants the politburo to meet and take decisions. It is willing to interact with the group if it is responsive to Israel’s demands and conditions. Indeed, Salah Al-Aruri, a key figure attending from overseas, is on Israel’s most wanted list. Shafei continued that Hamas needed its entire politburo to meet so it can take unified decisions on a variety of issues. Shafei said the US administration is aware of what is taking place and supports the path to a truce. It does not object to conciliation if it serves de-escalation, but will ignore conciliation and the Palestinian leadership if the truce faces problems.